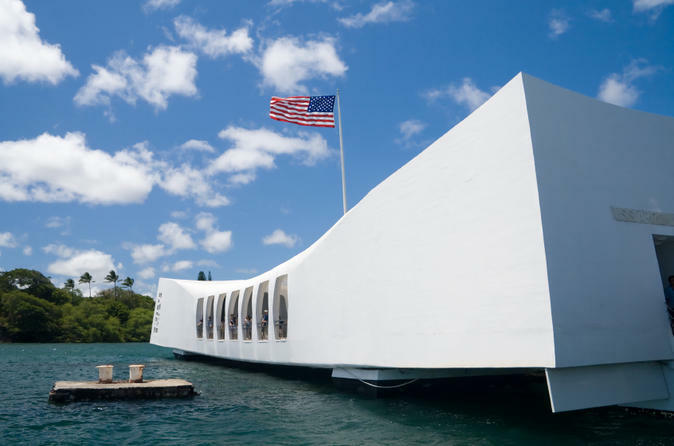 This Premium tour features the Valor in the Pacific Monument in Pearl Harbor, Punchbowl National Cemetery and Historic downtown Honolulu aboard the most comfortable and luxurious mini buses or Mercedes Benz Sprinter in Black color on Oahu. You’ll enjoy large viewing windows and more importantly you will not sit in a large bus with 64 others. This is considered a small group tour. The ticket for USS Arizona Memorial is included without waiting in a long line. Travel Back in time while our Tour Guide conducts you on a journey to December 7th, 1941 as we visit the National Memorial Cemetery of the Pacific (Punchbowl Crater) historic Honolulu City and Pearl Harbor, site of the attack that changed the world. Standing guard over the battleship’s sunken hull, the immaculate white USS Arizona Memorial honors the 1,177 crewmen who died during the attack. Thousands of visitors come to the memorial yearly to pay tribute to America’s fallen heroes. We will also visit the famous USS Bowfin Submarine Museum and Park. The formidable Bowfin Sub marine sank 44 enemy ships during the war, thus earning the nickname, “The Pearl Harbor Avenger”. Inside the Bowfin Park is the USS Bowfin Museum where you can check out their impressive display of submarine-related artifacts including WWII battle flags, an authentic Japanese Kaiten torpedo, and a Poseidon missile exhibit. To complete your tour we will take you on a downtown Honolulu City Tour. In Honolulu’s historic district you will see Chinatown, ’Iolani Palace, Washington Place, the State Capitol Building, and stop for photos at the King Kamehameha’s Statue. Then its on to the National Cemetery of the Pacific in Punchbowl Crater. Marvel at these historic wonders when you book our USS Arizona and USS Bowfin Submarine Tour. We’ll provide everything you need – tickets, and transportation – because we want nothing more than for you to enjoy this tour. No lines, no waiting – just a memorable tour of Pearl Harbor. Your professional tour guide entertains, narrates, and provides experiences that will make this tour a lasting memory for every Hawaii visitor. Each tour guide shares special insider knowledge about living in Hawaii, and Hawaii history during the tour that you don't find in guide books! And as on all Royal Hawaiian Limousine Tours, Complimentary Cold Bottled Water for all passengers! We have 2 different pick up times each day from Waikiki hotels that clients can choose from: 6:45 and 10:00 AM.